Learn ‘When to Do What in Your Job Search’—from writing your CV to negotiating your contract—at this free event for physicians. A panel of four in-house physician recruiters will answer physicians' job-search questions at the Career Advancement Workshop. In-house physician recruiters play a critical role in health care. Without recruiters, organizations can’t get the providers they need, and without providers, patients can’t be seen. What are the best practices for writing a physician CV? How should physicians request references? When are interviews scheduled, how can physicians best prepare, and how should physicians analyze employment opportunities? Both training and practicing physicians who are looking for new opportunities can learn the answers to these questions and more at the PracticeLink Physician Career Advancement Workshop and Job Fair on Tuesday, June 16, 2015. The drop-in Job Fair is from 5:30 to 8:30 p.m. at the Hilton Seattle at 1301 6th Avenue, Seattle, WA. The Workshop begins at 6:30. To register for the event, visit PL.PracticeLink.com/jobfairs/Seattle. At the free Career Advancement Workshop, residents and fellows will learn the details of the job-search timeline they should follow as they transition from training to practice. Attendees are encouraged to meet with in-house physician recruiters at the event. These recruiters are hiring physicians for facilities nationwide. The goal of the event is both to provide the job-search education physicians need and to connect health care facilities with the providers they need. According to the Association of Staff Physician Recruiters, physician openings take an average of 204 days to fill. Because physicians are the primary revenue drivers for health care organizations, each physician vacancy represents hundreds of thousands of dollars in lost revenue. Health care organizations are trying to stay on top of the worsening physician shortage by partnering with PracticeLink. “In-house physician recruiters play a critical role in health care. 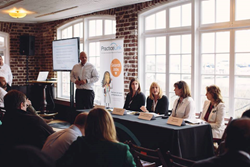 Without recruiters, organizations can’t get the providers they need, and without providers, patients can’t be seen,” said Ken Allman, CEO of PracticeLink. PracticeLink.com is the most widely used online physician job bank. More than 20,000 physicians and advanced practitioners register with PracticeLink.com each year in their search for a new job, and thousands more search the job bank confidentially when looking for a new practice. More than 1,000 recruiters representing more than 5,000 health care facilities nationwide use PracticeLink to recruit physicians and other health care providers. PracticeLink is headquartered in Hinton, West Virginia, and also has offices in St. Louis and Louisville, Kentucky.